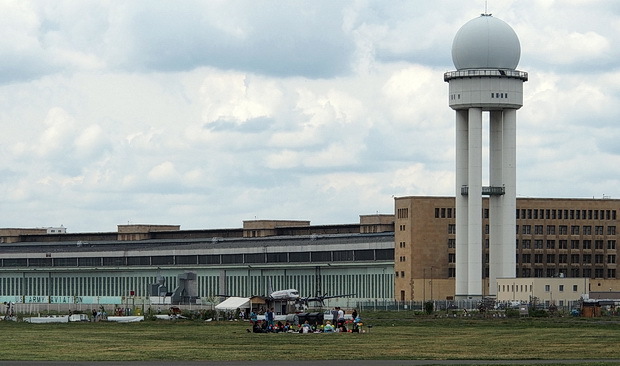 Once the third-busiest airport in Europe, the former Berlin Tempelhof Airport lay abandoned for several years after its closure in 2008 before being turned into a fabulous public park. 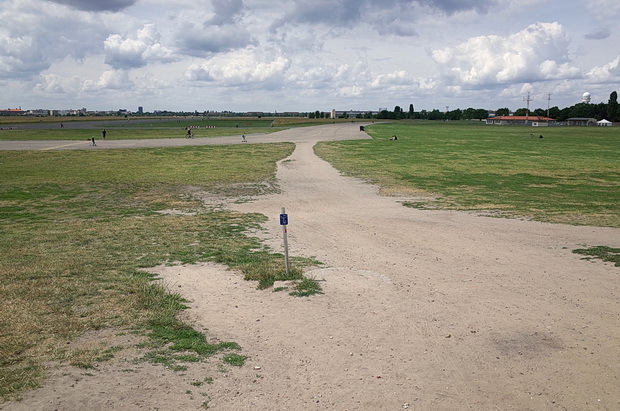 It’s not the first time that the area has been used as a park: the Tempelhofer Feld was originally a parade ground, used by Prussian forces, and later by unified German forces, from 1720 right up to the start of World War I. Once the military had buggered off on weekends and public holidays, locals would arrive en masse, clutching baskets full of food, booze, deckchairs and umbrellas and enjoy picnics on the large flat expanse of land. The area has a long association with flight: in 1909, Frenchman Armand Zipfel made the first flight demonstration in Tempelhof, with Orville Wright taking to the air later that same year from the same place. An airport was built on the site in the 1920s, with its central location helping it become one of the world’s busiest airports, with up to 52 foreign and 40 domestic flights arriving and departing during 1938–1939. Conceived by the leaders of the Third Reich as an architectural testament to the boundless ambition of German supremacy, a striking new terminal – described by British architect Sir Norman Foster as “the mother of all airports” – was built between 1936 and 1941. Above can be seen archive 1938 footage of the airport. Check out the posh lady getting off covered in furs! The building complex was designed to resemble an eagle in flight with semicircular hangars forming the bird’s spread wings. The mile-long long hangar roof was planned to support stadium seating for more than 80,000 spectators to view air and ground demonstrations. Other parts of the airport that were never finished were the stairs up to the roof, a planned waterfall, large-scale office buildings that were to surround the western side of the circular plaza, and the control tower. 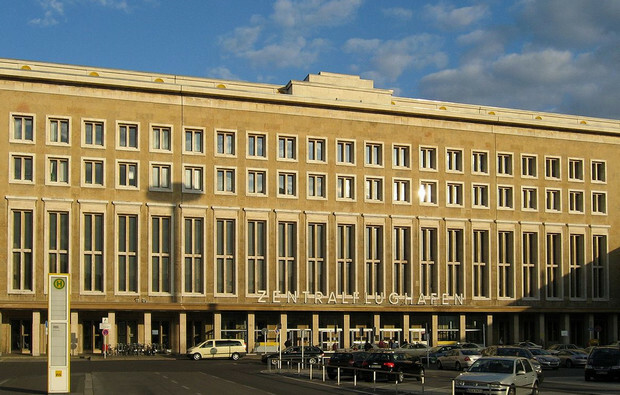 Such was its scale, Tempelhof Airport’s main building was once among the top 20 largest buildings on earth. Despite its immense size, it also hosted the world’s smallest duty-free shop! 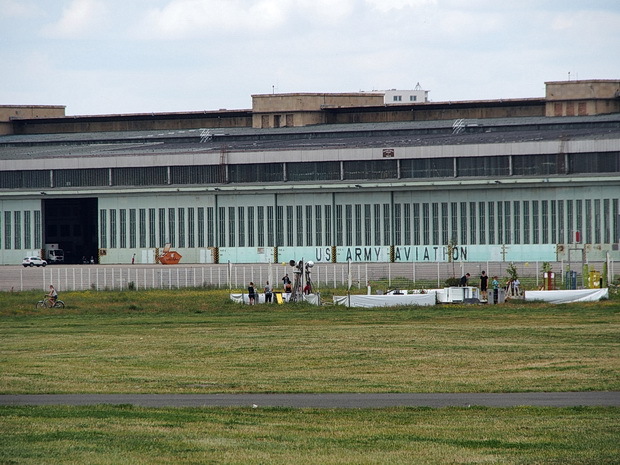 The airport was used for building fighter planes during WW2 and it played a significant part at the end of the war, with Western Allied and German signatories of the German Surrender in Berlin and their entourage landing at Tempelhof airport on 8th May 1945. The airport was to play a major part during the Berlin Airlift (also known as the Berlin Blockade) of 1948, when Soviet forces halted all traffic by land and by water into and out of the western-controlled sectors of Berlin. During the following eleven months, the city’s 2½ million residents were supplied by what has been described as one of the greatest feats in aviation history. 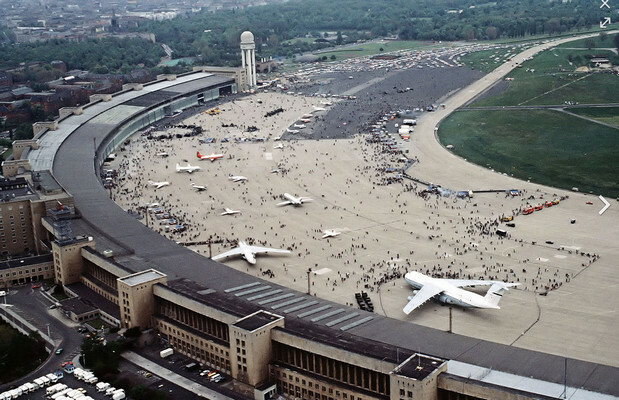 In the 60s and 70s, Berlin Tempelhof became a major international port, with commercial traffic peaking in 1971 at just above 5½ million passengers. 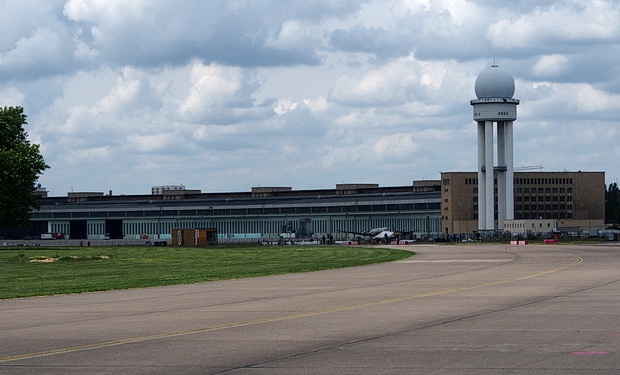 The end was in sight however, when the authorities announced plans to concentrate all domestic and international air traffic in Berlin and Brandenburg at one airport: Berlin-Schönefeld International Airport. 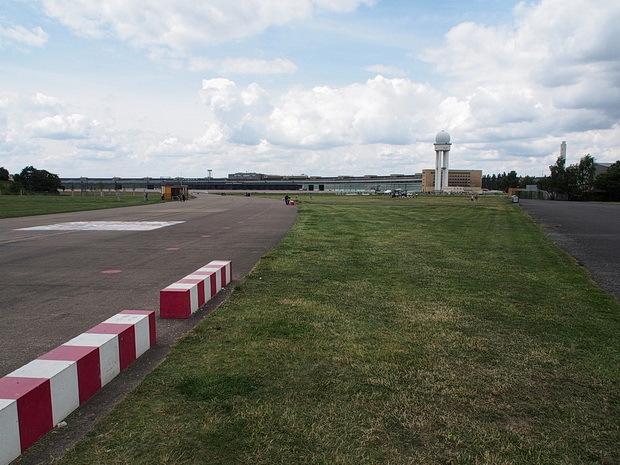 The last flights from Tempelhof Airport took off in November 2008. Had it been in London, the site would now be packed full of luxury lifestyle flats occupying the ‘Airport Quarter’ or something equally ‘exclusive’ and hideous, but happily they do things differently in Berlin. 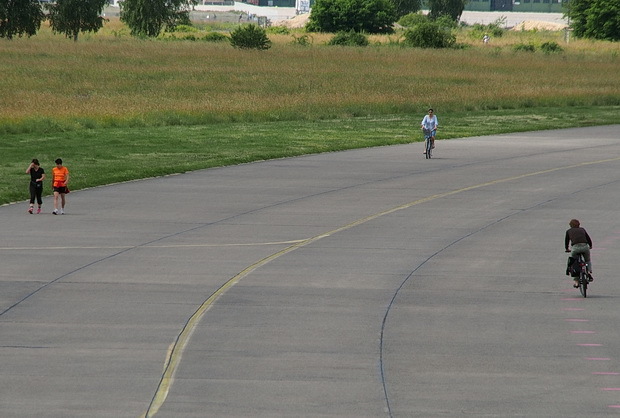 After the airport closed in 2008, the city of Berlin reclaimed the entire 386-hectare open space – larger than New York City’s Central Park – for public use. Visitors today can now enjoy a six-kilometre cycling, skating and jogging trail, a 2.5-hectare BBQ area, a dog-walking field covering around four hectares and an urban gardening section. The park is just 2 miles from the Potsdamer Platz, close to the heart of Berlin city centre, and it can be accessed via three entrances at Columbiadamm, Tempelhofer Damm and Oderstrasse, and it’s open from sunrise to sunset. There’s also guided tours available of the old airport terminal building (still the largest building in Europe by surface area). 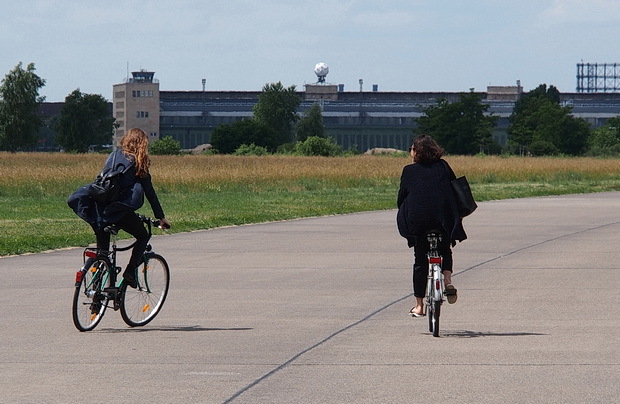 Although housing developments are planned for the edges, the Tempelhof fields will now be used as a park indefinitely. Here’s some more views of the park taken in June 2014. Sadly, we didn’t get time to take in a tour of the building, but we’ll be back! Stranded aircraft outside the terminal building. 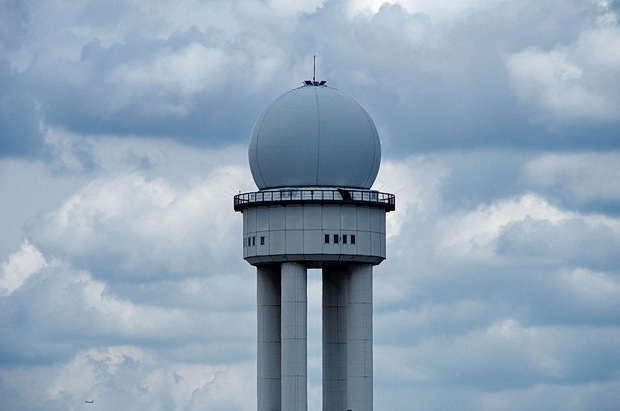 Air traffic control radar dome tower at Tempelhof Airport. 2013 Planting of the first trees for the development of the Tempelhof parkland. 2013 Planned opening of the “e-THF – Tempelhof Electromobility Competence Centre” as an information point for electromobility, including a showroom and driving experience track. 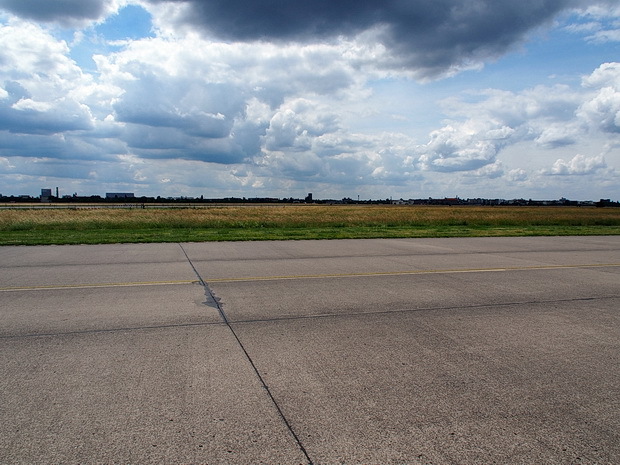 2012 Tempelhof Airport establishes itself as an international event location for trade fairs and conventions. Other parts of the building are renovated to improve energy efficiency and converted into a creative and start-up centre. 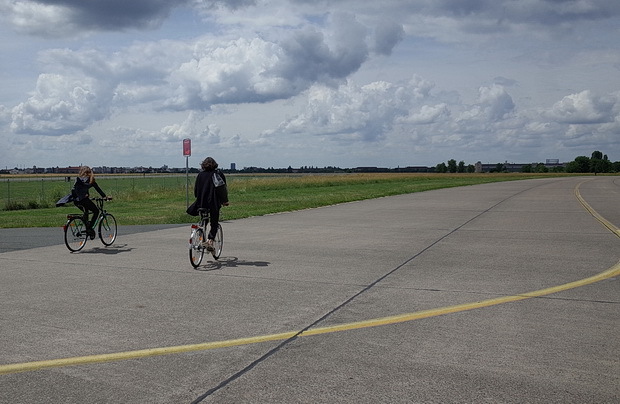 2010 Opening of the park “Tempelhofer Freiheit” on the former airport premises; it is open from sunrise to sunset. 2009 Trade fairs are held for the first time in the buildings of the former airport. 2008 A referendum seals the permanent closure of the airport. 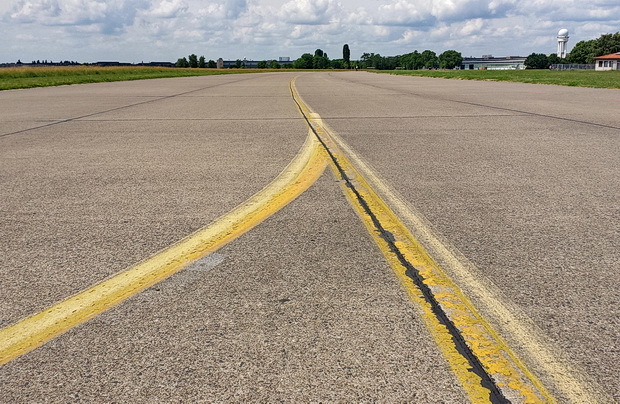 1996 Berlin, Brandenburg and the national government, the company shareholders, decide to build the Berlin Brandenburg International Airport (BBI) in Schoenefeld. 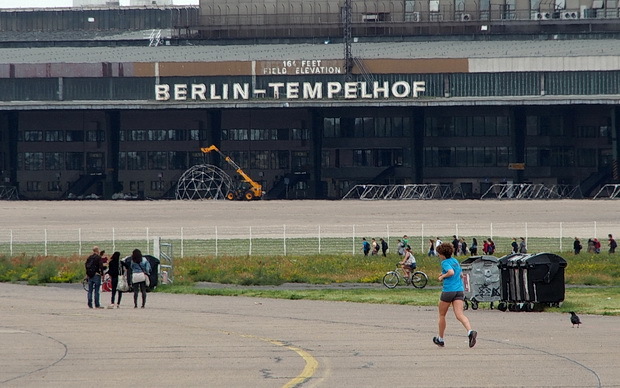 At the same time, Tegel and Tempelhof will be closed. 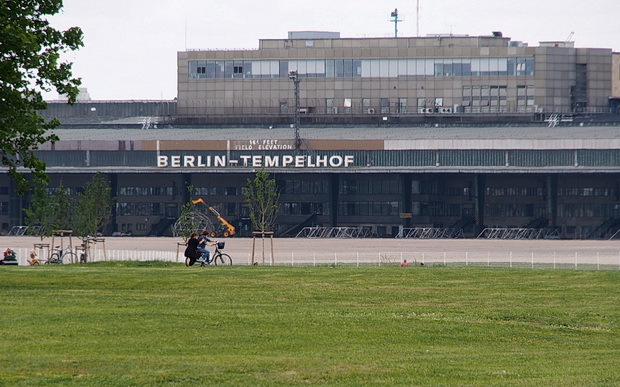 1993 The US Air Force hands the airport over to the Berliner Flughafengesellschaft. 1990 After the fall of the Berlin Wall, operations start up again for domestic flights. 1975 Since the airport had reached the limits to its capacity in the 1960s, operations are suspended after construction of Tegel Airport. 1961 The airport serves as one of several Berlin settings for Billy Wilder’s famous film “One, Two, Three”. 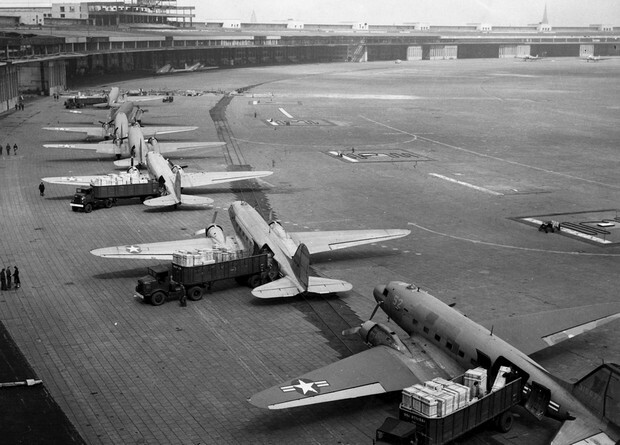 1951 Tempelhof Airport is released for civil air and freight traffic by the American occupation forces. 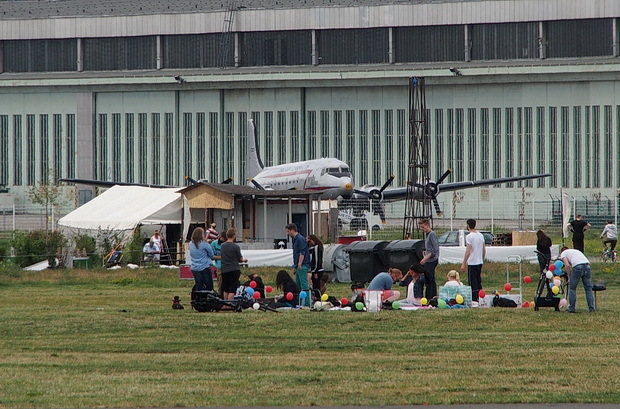 1948 During the Berlin blockade from June 1948 to May 1949, Tempelhof Airport becomes the take-off and landing site for the “raisin bombers” which assures the provision of vital supplies for the people in West Berlin and drops sweets, sometimes borne by handmade parachutes, to the delight of the children. A memorial designed by Eduard Ludwig still stands today, reminding us of the three air corridors and bearing the names of the 76 pilots who were killed in accidents during the Airlift. 1945 The forced labourers are freed by the Red Army. In July, the Red Army hands the airport over to US forces. 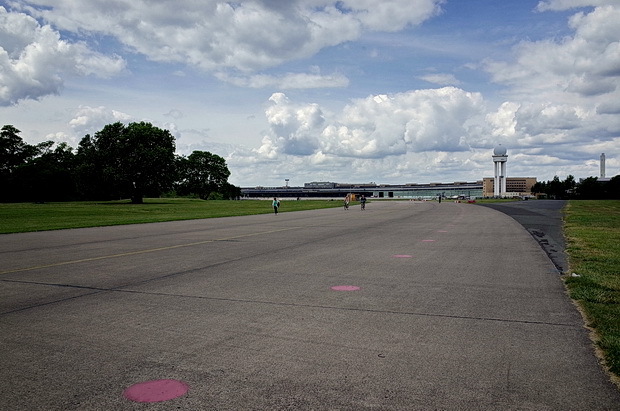 After undergoing extensive repairs, the airport, now called “Tempelhof Central Airport” (TCA), commences operations again. 1939 The construction site of the planned new airport becomes one of the world’s largest assembly buildings for bomber planes. The work is later done by forced labourers brought in from countries occupied by Germany. 1936 The construction of an airport designed to handle six million passengers begins; the scale is in line with the megalomaniac project of a “World Capital Germania”. However, this airport is never completed. 1934 At the instigation of the National Socialists, planning begins for a “large airport”, and the architect Ernst Sagebiel is awarded the contract for its design. 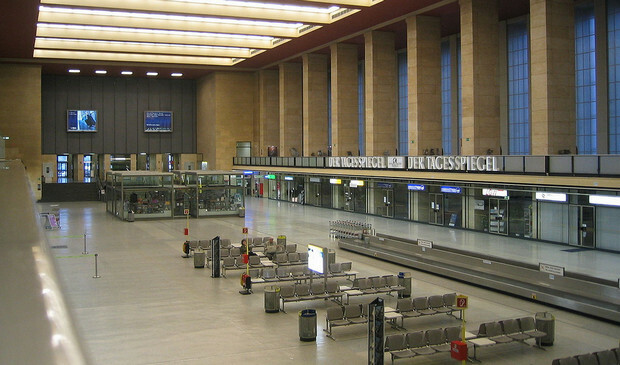 1934 The expansion of the airport begins; Tempelhof becomes the most modern airport of the time, featuring separate functional levels for passenger and post/freight traffic. 1926 The first scheduled flights to Dübendorf (Switzerland) and Munich take off. 1924 The Berliner Flughafen-Gesellschaft mbH is founded. The expansion of the airport also begins in 1924. It is the only airport in the world with a direct connection by underground (U6, underground station Paradestrasse). 1923 Air traffic operation begins. 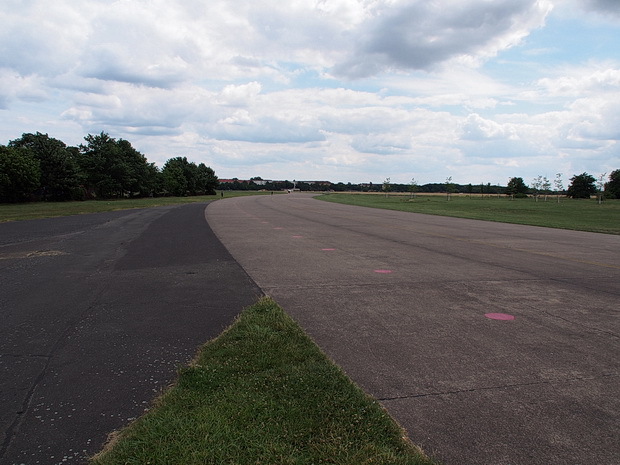 1922 A new central airport is planned for construction on Tempelhofer Feld, although the area was originally marked for the construction of a trade fair area. 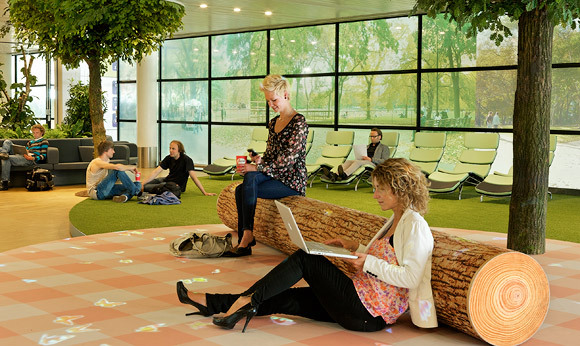 But a small airport with two wooden buildings, each of them with an area of 1,000 square metres, is built instead. 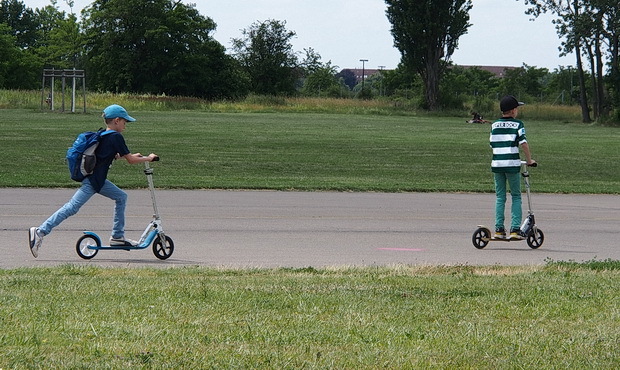 1909 Orville Wright, who together with his brother Wilbur was the first person to fly a steered motorised aircraft, organises an air show lasting several weeks at Tempelhofer Feld, a former parade ground. In September 1909, he succeeds in staying in the air for one hour and sets a new world record for altitude of 160 metres. Photos of Treptower Park, the Soviet War Memorial in Berlin, Germany Photos of graffiti and artwork on the Berlin Wall, Berlin, Germany Berlin street photos – a selection of photographs A walk through Treptower Park and the Island of Youth, Berlin Photo feature – Turkish Market, Maybachufer in Berlin Neukölln, Germany My favourite Berlin bar – Bar Mama, Hobrechtstraße 61 12047 Berlin Berlin graffiti, signs and street scenes – photo feature Amsterdam’s Schiphol Airport Park opens – with my photos on the wall!